The best recipes are often accidental. So it was with this one-dish supper. I placed boneless chicken thighs, a staple in our house, on a baking sheet. 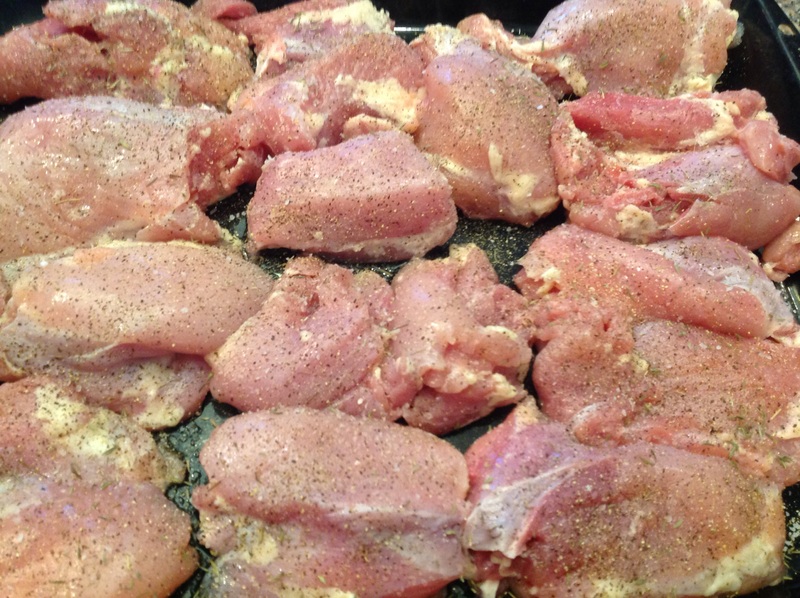 I prefer chicken thighs to breasts for roasting as they are more flavorful and won’t dry out. 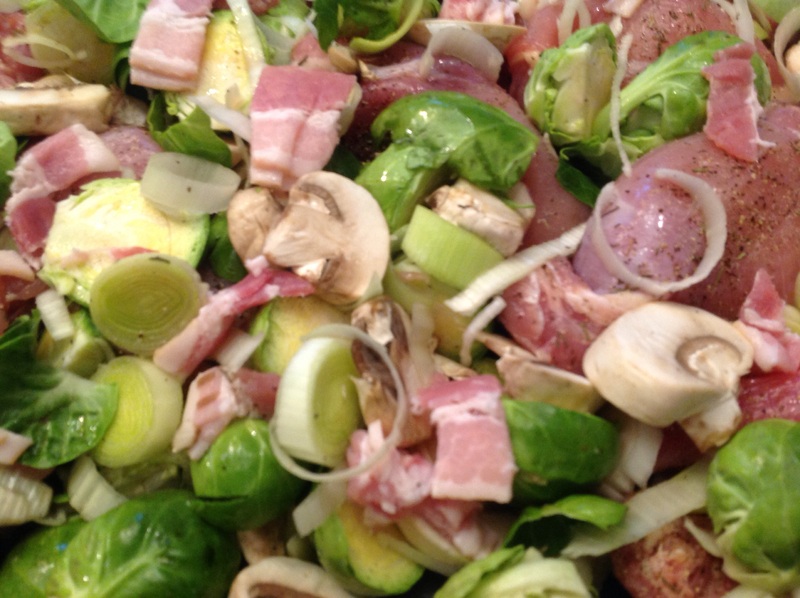 Seasoned simply with salt, pepper and French thyme then smothered with sliced leeks, halved brussel sprouts and sliced white mushrooms this is a great winter one-dish meal. Next the dish is sprinkled with chopped bacon for flavor and to provide fat for roasting. If you omit the bacon, splash some olive oil on top. Roasted on the lower rack at high heat, the veggies crisp up nicely and the flavors are dynamite together. Be sure to run a wooden spoon throughout a few times during cooking for uniform roasting. Toss a few glugs of balsamic vinegar on top right before serving to add a note of brightness. Dinner in about a half hour. My kind of weeknight! Method: In a shallow, rimmed, baking sheet, spread out the chicken. Season with the salt, pepper and thyme. Smother with the leeks. 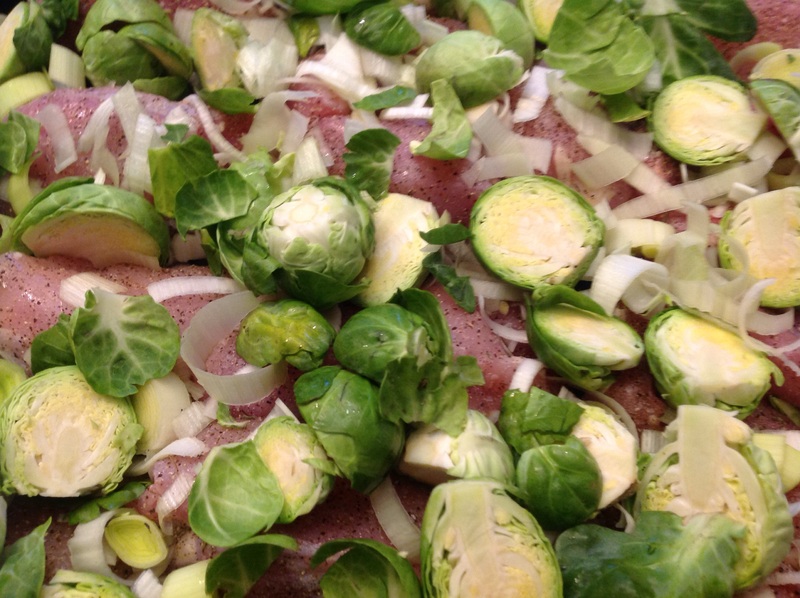 Trim and halve the brussel sprouts and toss on top of the chicken. Scatter the sliced mushrooms on top and finish with the chopped bacon. Roast on the lower rack for 20-30 minutes, giving the dish a few scrapes of a wooden spoon to keep everything cooking evenly. Before serving, splash a few glugs of balsamic vinegar to taste. Scrape all those tasty bits from the roasting pan! Mushroom and bacon added, ready to ROAST! We served ours over mashed parsnips. It would be equally good on polenta or mashed potatoes. 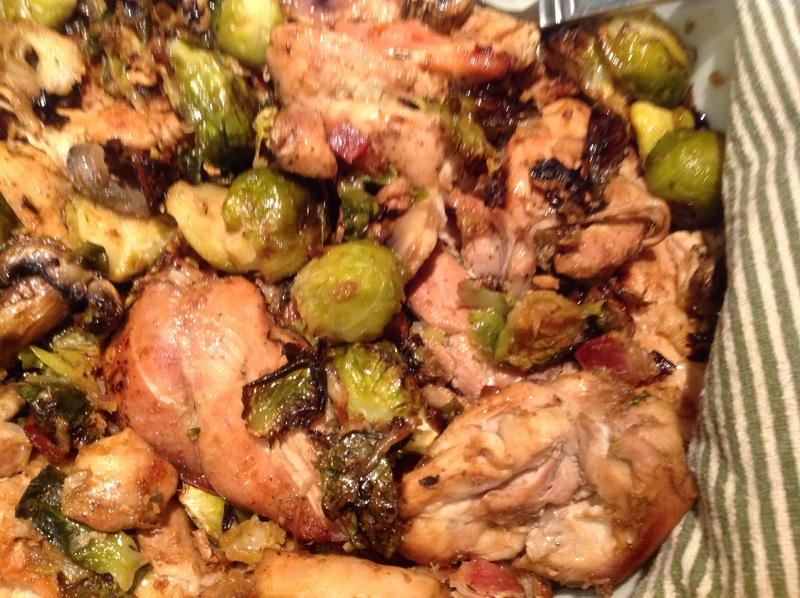 This entry was posted in Recipes and tagged one dish oven roasted supper, Roasted chicken thighs with brussel sprouts bacon leeks and mushrooms by Johanne Lamarche. Bookmark the permalink. 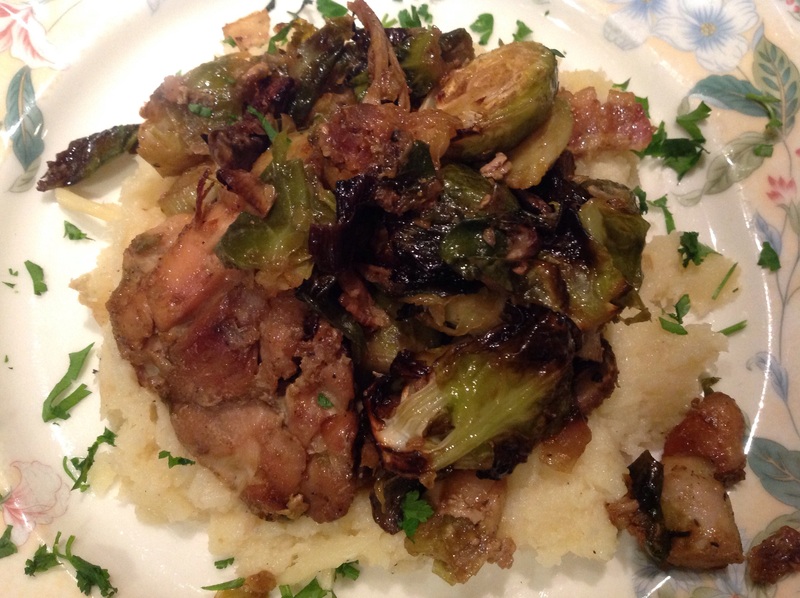 All my favorites – I do something similar with the chicken, but cook it with the balsamic vinegar, I’m sure the bacon gave it an extra yummy flavor! Johanne, you have everything a hungry person with good taste needs in a meal. Brussels sprouts are a food we eat every single week at least once, but I usually cook them on their own. With your recipe there is less mess to clean up! I imagine that the bacon would flavor the chicken so wonderfully, too, as I am not a huge fan of chicken due to (my opinion) lack of adequate meaty taste. Bravoe! Bacon makes everthing taste good Sue, even chicken!!!! Thanks for stopping by. I LOVE your photography so it’s a real honor for me to receive a comment from you! Thanks Liz! It was really good and quick to throw together. Thanks for your comments. Hope your ataying safely indoors in the ice. We are in AZ with friends.